People who are new to the game of golf often need a bit of direction to put them on the right path. It is important to understand that every person has their own unique golf swing — their own natural way of swinging a golf club. In my opinion, people see the best results when they work with their natural swing and make the proper adjustments they need to make to hit the ball solidly. Trying to emulate or copy the swing of someone else usually never works out well because of differences in body shape, muscle makeup, and general movement tendencies among other things. It is not easy to change any of these things, nor is it worth doing so. The goal should be to simplify as much as possible and find the things that work best for you. With that said, there are certain fundamentals that golfers should grasp in order to stand the best chance of improving the consistency of their golf swing and hence their golf game. The tips that follow below touch on many of these fundamentals. They are intended to help you get organized, focused and consistent. Consistency is key; if you can develop a consistent swing, most of the battle is already won. Arguably the most important component of the golf swing, everything starts with the grip. Often times, issues experienced by golfers can be eliminated by simply changing their grip. In general, there are three grip styles: the weak grip, the neutral grip and the strong grip. Each style has its own advantages and disadvantages, but the best and easiest grip to get started with as a beginner is the neutral grip. With your right pinky touching your left hand, you can either overlap it into the crease between your left index finger and left middle finger in an overlap grip, or you can interlock your left index finger and right pinky in an interlocking grip. Which grip to use mostly comes down to personal preference and is up to the the individual. This consists of two parts: posture and alignment, which are very important to master. Posture: When your posture is sound, you have the foundation for a consistent swing with a good coil. You should always feel like you are in an athletic position. When you bend over the ball, bend with your hip joints and not your waist. A hallmark of bad posture is a rounded back — keep your back straight but don’t arch it. Also bend your knees slightly. Making a couple of practice backswings at address might help you to find the correct position that will maximize your mobility for the swing. Alignment: You will never get the results you want if you aren’t aligned properly. 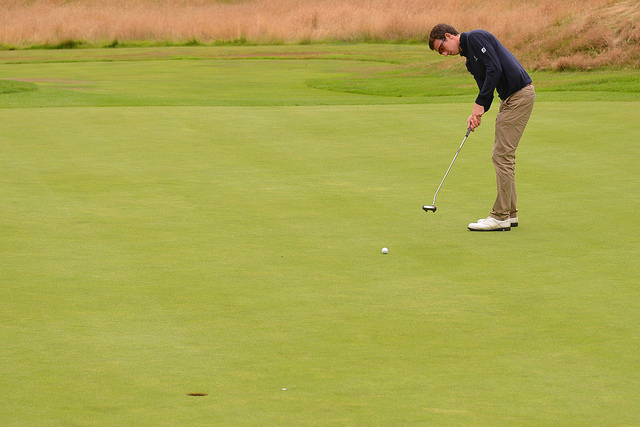 Many times golfers believe they are correctly aligned when they actually aren’t. Your shoulder line and your foot line should be parallel to the intended target line. A nice little trick to help you find the right position is to pick a point a few feet in front of you that is on the target line and set up square to that point; it’s easier to gauge whether or not you’re square when you’re referencing a spot close to you. A simple adjustment for alignment can go a long way towards improving your game. Once you have your grip and your address figured out, it’s time to initiate the backswing. Making a good backswing is not nearly as complicated as many people make it out to be; you just need to find something that works and do it consistently. All that matters is a solid strike that flies down the target line, and whatever backswing helps you achieve that consistently (and doesn’t put excessive stress on your body) is one that you should run with. With that said, the basic idea of the backswing is to rotate away from the target. When making a full swing, try to rotate your shoulders until your left shoulder (for a right-handed golfer) is just about under your chin. Beginners should focus on keeping their head level and moving it as little as possible. For more power, hinge your wrists as you take the club back so that, at the top, the club is nearly parallel to the ground. For less power, use the same principles just mentioned but less wrist hinge and a shorter swing. Keep your eye on the ball or on a point near the ball all throughout the turn. Make the backswing in a comfortable fashion and at a reasonable pace. From the top of the backswing it’s just a matter of swinging back through the ball to complete the downswing. Continue to keep your eye on the ball, your feet planted and your head as level as possible to avoid hitting it fat or thin. Rotate your shoulders back towards the target and let your wrists naturally unhinge as the clubhead approaches the ball. Accelerate through the ball at a solid speed, but avoid trying to “kill” the ball starting out. Trying to swing too hard usually tenses up the muscles involved in the swing and compromises form. As you get more experienced and consistent in golf, you can gradually start to swing faster. There is no such thing as a perfect golf swing, and you will no doubt have a predominant miss. Whether it’s a slice, a hook, a ball that’s too low, a ball that’s too high, a tendency to top it, hit it fat, hit it near the toe or the heel, there will always be something that you need to work to improve. Problem: You tend to slice with the driver and/or fade with irons. Possible fixes: Check that your grip is neutral; check that your address position is correct; focus on turning your hands over through impact. For much more information, see my article on slices. Problem: You tend to top the ball or hit it thin. Possible fix: Maintain your height throughout the swing and don’t “stand up” through impact. Problem: You tend to hit the ball fat. Possible fixes: Keep your height throughout your swing and avoid any “squatting” through impact. See my article on fat shots. Problem: You tend to hit it near the toe or heel. Possible fixes: Keep your eye on the ball at all times during the swing; avoid any unnecessary movements. Although these fixes don’t apply to everyone, you’d be surprised at how effective they can be. Keep an eye out for more articles that will be rolled out on Golfstead over the coming months that discuss solutions to swing problems in more detail. This content is meant to provide a good starting point for those who have just gotten into golf, who have never swung a club before or who just don’t really know how to make a solid swing. If you have any questions or comments about these beginner tips, feel free to drop a comment below! 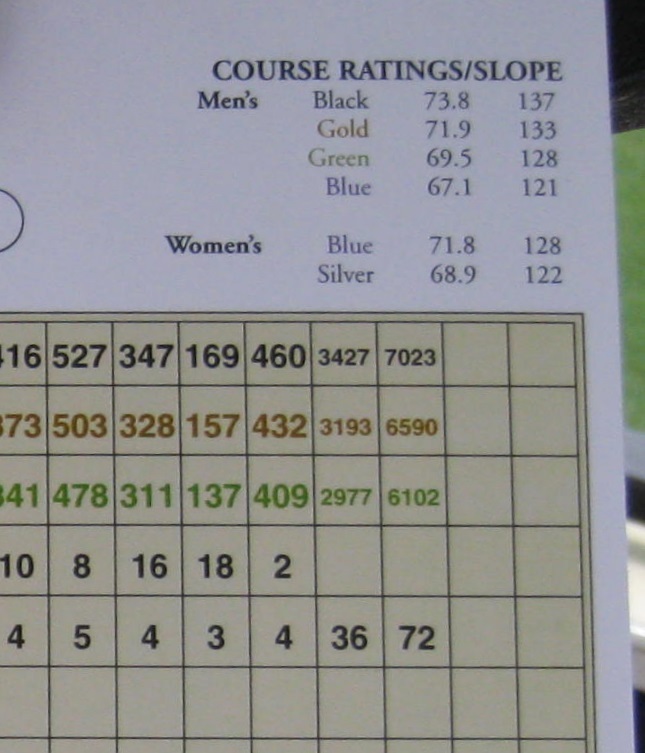 What Is A “Handicap” In Golf? Confusion No More! I tried Golf when I was very young and what you are mentionning is key basic componnents for starters! Very well written and explained for someone who would want advice! Can’t wait to read more! Thanks. This is primarily aimed towards newbies, but it can even help more experienced golfers who might just need to get back to basics. Hey there! I am a pretty solid golfer myself. I actually live on a golfcourse and everything! But everything you said about the early stages of learning is key! The first club I got was a a trainer club with that special grip! That helped me a lot. Ever since then I have never had a problem with grip. Well anyways Thanks for being a great golf bloger! My question for you is.. what clubs do you play and how far can you hit a 7 iron? Thanks for the comment! I’m currently using a TaylorMade driver and woods, as well as Callaway XR irons and wedges. My 7-iron distance fluctuates depending on what irons I’m using, but with the XR I do roughly 150 on average — sometimes I can throw it about 160. I have only been playing golf for a little while and always looking to improve my swing, as there is much to improve. Really good tips and can’t wait to apply them to my game. Might be a really dumb question but what is the point of interlocking my fingers? It feels really uncomfortable. Thanks for reading Xander. Your choice of grip (overlapping, interlocking, etc.) is a matter of personal preference. Not a dumb question at all. I too find interlocking a bit uncomfortable — it feels like my fingers are “stretching” when I swing. There are plenty of people who prefer interlocking though. Many golfers change their grip style for different types of shots (tee shots, chips, pitches, etc.). I suppose it depends at least partially on your hand shape, size, length of fingers, etc. All in all, you should do what feels comfortable and allows you to be the most consistent on the golf course. Man…I really wish I would’ve read this a few weeks ago! Haha! I went golfing for the first time and I was just awful. Being a noob I feel like the article helped me out a bit with identifying what I might have beem doing wrong….which was a lot but oh well. I’ll keep these tips in mind for next time and see how it goes. Thanks! Glad I could help you out. Remember, I’m not guaranteeing that following these tips will turn you into a scratch golfer, but as I’ve said, they should help put beginners on the right path. Be sure to let me know how it goes! The biggest prolbem I see is leaning way back at address and on the back swing. Doing that doesn’t allow you to transfer your weight forward enough before you strike the ball, resulting in a weak swing. 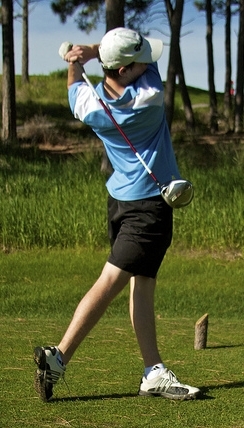 During the golf swing, you should only be turning the upper torso, not leaning back. That way, your downswing will be more powerful and result in longer drives, Doing what your doing probably opens up the clubface causing the slice you mentioned. Hope this helps!! Thanks for the input. Leaning back certainly can cause problems in the swing. You should also be turning your hips, but in the spirit of keeping things simple I just recommend doing what comes natural while conforming to the key fundamentals I discuss. I’m not sure what you’re referring to in your last statement.